If they were in fact up there, they would most certainly see stars. i mean, are you serious with that question? meaning in point of fact you are not sure whether you would see stars if you were floating around in outer space? these people are lying, is what i am saying. i'm not saying they have been up there. maybe, maybe not. they may be lying about everything, including being up there. i think most of the folks on this forum would theorize that. but again, if they ever were in low earth orbit, they most certainly would have seen stars. in fact, with no atmosphere it would have been nothing short of the greatest show on earth (so to speak). i'm actually ahead of you if the clip is what i think it is - the finale when chuck goes up up up to above 100k feet and sees stars. i love that. there are also bits from glenn's first flight and elsewhere in the flick that shows how it would really look like - stars when the blue evaporates. by coincidence, my first screen credit was with the producer of The Right Stuff, Bob Chartoff, who produced a screenplay of mine, a turkey called Beer - he hired the wrong director (another story). Consider someone using an optical telescope from the top of a real rocket, on a launching pad, looking upwards in a clear cloudless night, just before takeoff. They see stars. As they take off, and keep watching during ascent, the stars become brighter and sharper (we are told, due to the ever-clearer atmosphere). So, where exactly in altitude do we reach what I'll call the Post-Palomar Point, that transition when our rocket-powered observer starts to see his view of the constellations get worse than it was at ground level plus the height of the rocket? Because (appying this compliance paradigm of 'no stars visible from space') his wonderful view of the heavens can't just go click, and disappear. It must fade-out, to black. And that would be because....why, exactly? I think much of the imagery associated with this Virgin rocket escapade deserves closer analysis. Note that it appears to be very-cautious in it's cosmic astrography, just showing blue/black starless skies at all times (unless I'm missing them in the footage). The video glitches have a slightly formulaic feel to them, don't you think...? Every Easter my parents would dress us to the nines for church; we wore Little Fauntleroy crap with velvet collars and stuff like that. Then my father would get out his camera and shout to my mother: "honey, where is the book that goes with the camera?" I am adept at a lot of things. I designed and built the computer I am typing on but like my father I am all thumbs with cameras. I just wish someone would put to bed the whole stars on the moon debate; certainly you could work it out with some maths as the Brits say. Sans camera, of course, I did a little thought experiment. I went to the local grocery store. It was dusk, the sky was a deep blue and there was no red sky in the west. For all practical purposes the sun had set. Yet, because the sky would be black twenty minutes later I am calling the blue sky a function of sunlight. I was able to "resolve" a planet in the sky quite clearly and at the same time read clearly the gold lettered sign at the entrance to the super market parking lot. Though I was a little cross-eyed I could see both near and far quite well at the same time and remember we have binocular vision so my two "lenses" (eyes) really isn't a distinct advantage over an astronaut's camera lens on the moon. The problem is that there is some truth to the idea that cameras often have trouble recording stars and terrestrial objects at the same time. Some truth. This includes both film and digital mediums. Take a look at these photos. Many of them show no stars in the sky though some do. But, NASA has taken this situation to a ridiculous extreme by claiming that stars are invisible even to the naked eye by an observer who is in space. This is ridiculous because stars are obviously visible to our eyes at night from Earth so why would they vanish if we were to travel into space? The stars would obviously become more visible, not less. With no atmosphere to obscure them, they would become far more visible than they ever were on Earth. And, another aspect to this problem: The bane of Earthbound stargazers is light pollution. The lights of cities reflect back at us from the atmosphere and this reflection “washes out” the dimmest stars. That is, the contrast between the dark sky and the stars is reduced so the stars become harder to see. To combat this effect astronomers seek out “dark skies,” that is, skies away from city lights where the stars are the most visible. But, if we were in space we would have the darkest skies of all because there would be no atmosphere to cause this effect. There would be the Sun and it would be difficult to see stars near the Sun's position but in other parts of the sky the stars would be far more visible than on Earth because the sky would be far darker than it could ever appear to us on Earth. Loved the video! I think NASA et al are not keen on including stars in their fake images from supposed LEO because it’s generally too difficult and time consuming. Making a mistake in the structure of a constellation and attracting the ire of acutely aware amateur astronomers, I guess is not something to be desired. In my own humble they’ve made an almighty screw up with this ‘space telescope' nonsense simply because it’s contradictory to what everybody else that has ever been into space says...that yeah, the stars don’t appear brighter and more glorious as one would expect, in fact they pretty much disappear altogether. ...taken from this set.. http://www.telegraph.co.uk/technology/p ... me=2192581 ...where you can read with frustration the ‘oohing’ and ‘cooing’ comments from readers who unbeknown to them, are having their brains systematically rogered senseless. 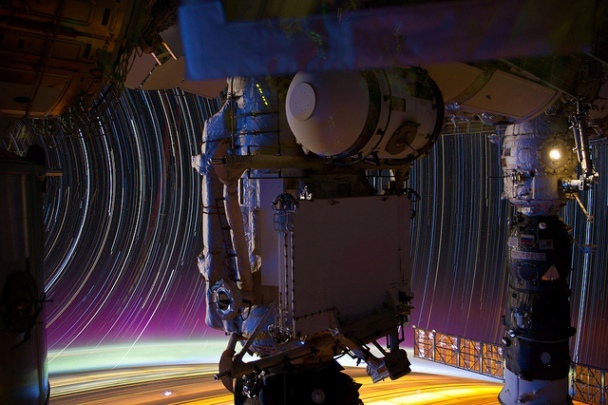 ...taken from here... http://fixil.blogspot.co.uk/2012/06/lon ... m-iss.html where we see that yes, incredibly, it’s not a joke but indeed ‘real life’ time-lapse images credited to NASA actornaut Don Pettit. Now I quite like this idea that there are some ‘good-guy’ digital artists beavering away in their cave somewhere near area 51 who are trying, not so subtly, to tell people it’s all a charade. That they deliberately put out these totally non-sensical images (like the one’s above) in an effort to get people to understand that they are being had. Sadly though, I think it much more likely that they’re just twerps whose imaginations are less adept than their computer skills. Wish I’d taken a screenshot, because around a year ago an article appeared in the above mentioned British newspaper that purportedly showed images of Earth snapped from a ‘geostationary satellite’. The comments section was open and after the usual ‘oohs’ and ‘ahhs’ somebody noticed that there was a bloody great city in the middle of the Australian outback which has certainly yet to be built. All of a sudden, the comments went from complimentary to ‘what the hell does this mean?’ type thing yet if I remember correctly, not a single one suggested that it might just be fake...then comments were closed and the article disappeared into the ether. Yes, so for the ‘actornauts’ sometimes there are stars, sometimes there aren’t but for Hubble they’re absolutely bloody everywhere, all the time even the ones that were supposedly created just after the ‘big bang’ itself As said, I think ‘the space program’ desperately needs a director of continuity. Here's a link to this very topic being discussed much more thoroughly than we are here. There is still no proven consensus (we need experimentation for that, though I believe some are in the works), but the gist of it is, that you may NOT actually be able to see stars with the naked eye without viewing through an atmosphere (lens). NO STARS - ON NASA IMAGERY? There is still no proven consensus (we need experimentation for that, though I believe some are in the works), but the gist of it is, that you may NOT actually be able to see stars with the naked eye without viewing through an atmosphere (lens). In particular, check out what Dr. Lindemann has to say from 4.50 onwards...very interesting indeed! Naturally this in no way absolves NASA et al from fraud and chicanery...Hubble right? Hubble is up there beyond Earth’s atmosphere because the stars and everything else are so much clearer!! Did you ask any of those same fliers did they notice an empty black sky while flying at night? The Whole Earth Catalog was a compendium of tools and tools to make tools for the 20th century pioneer who wanted to get off the grid. It had information on domes,zomes,yurts,bee keeping, weaving etc. Let's look at what Wiki has to say: "The Whole Earth Catalog was an American counterculture catalog published by Stewart Brand between 1968 and 1972, and occasionally thereafter, until 1998. Although the WECs listed all sorts of products for sale (clothing, books, tools, machines, seeds—things useful for a creative or self-sustainable lifestyle) the Whole Earth Catalogs themselves did not sell any of the products. Instead, the vendors and their prices were listed alongside the items. This led to a need for the catalogs to be frequently updated." What makes it interesting for our purposes is, of course, the cover. The cover is supposedly a NASA photo, like the one Simon posted above. Any stars may be merely smudges and nicks on the black cover. Ostensibly, the catalog was named to celebrate a recent victory of the publications' founder Stewart Brand. Brand saw space exploration as a way to unify humanity and thought that nothing could be more unifying than to take a picture of us, humanity, all together as it were. With that in mind, he beseached, nudged and implored NASA to publish a photograph of the whole Earth which to that point we hadn't seen. He even had a public relations campaign complete with buttons. Doubly interesting is the possibility that Brand, a counter culture genius, is linked to the CIA. Brand, who also published CoEvolution Quaterly and The Whole Earth Software Review was a member of The Merry Pranksters a group which many say had its roots in MKULTRA . In a way, the topic about whether stars are visible to the human eye outside the atmosphere and whether they can be photographed is interesting. On the other hand, it´s a waste of time. If the Earth can be seen from the Moon, then stars can also be seen in space. If the Earth cannot be seen from the Moon, then stars probably can´t either. The gif below (borrowed from another thread) sums up the conundrum very nicely: Either the Earth is visible, despite adjustment of the exposure to a close-up sunlit object, or it is not visible, for the same reason. To keep us busy arguing forever and to make us appear unlearned, NASA simply says it´s both. If I make the observation that this supposedly-real NASA photograph photograph of 1960s vintage, appears to be significantly not-to-scale (when compared to any other more-recent web references I can find), I take it you won't be surprised? The current directed groupthink appears to settle on approximately 30 earth diameters separation between us and the moon (the homework page http://btc.montana.edu/ceres/Worlds/earthmoon.htm is particularly-representative of this modern mantra, claiming to detail exactly how to construct a representative image). Every photograph purporting to show the actual apposition of the binary reality we're spinning on (or not) right now, possibly also all artworks. Starless wonders, in the main, crafted by compliant conceptualists.